Next Parish America von Joan and Ray Stagles. Dieses Buch enthält viele alte schwarz-weiß Fotos des Lebens auf den Blasket Islands. Es erzählt (in englisch) über die Einwohner, das harte Leben bis 1953 auf den Inseln. Die englische Buchbeschreibung: A beautifully illustrated and compelling history of the life, traditions and customs of an isolated community that has now disappeared. 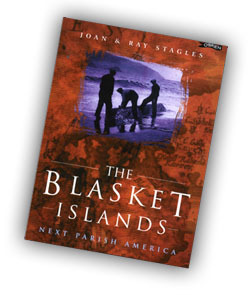 The book traces the fate of the Blasket people and the slow erosion of their culture to that sad day in 1952 when the families were evacuated from the Great Blasket Island. Newly updated taking the story of the Islands and islanders to the present day.